( The two pictures featured can be copied onto a plain sheet, right click-copy then paste, and printed on an O.H.P. acetate/projected on a screen from a computer to illustrate the talk). Has anyone ever seen a King? If not , a member of a Royal Family? What did they travel in? Limousine, helicopter, private jet, Royal yacht, or Royal Train? 2,000 years ago what type of transport do we think rulers had? Horse, chariot, carriage, carried on a throne with supports? This is something like Caesar, the Roman Emperor would have looked like ( left ). As you can see he and his horse are magnificent, armour plated, prepared for battle, victorious. I'm now going to read the story from the Bible about King Jesus and the time he came into Jerusalem, the capital city of Israel. People called out that he was a King. But he was a different kind of King. This is something like what he would have looked like ( right ). Luke 19:28 After Jesus had said this, he went on ahead, going up to Jerusalem. 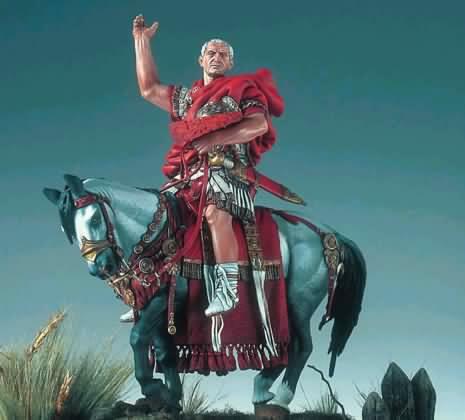 29 As he approached Bethphage and Bethany at the hill called the Mount of Olives, he sent two of his disciples, saying to them, 30 "Go to the village ahead of you, and as you enter it, you will find a colt tied there, which no one has ever ridden. Untie it and bring it here. 31 If anyone asks you, `Why are you untying it?' tell him, `The Lord needs it.' " 32 Those who were sent ahead went and found it just as he had told them. 33 As they were untying the colt, its owners asked them, "Why are you untying the colt?" 34 They replied, "The Lord needs it." 35 They brought it to Jesus, threw their cloaks on the colt and put Jesus on it. 36 As he went along, people spread their cloaks on the road. 37 When he came near the place where the road goes down the Mount of Olives, the whole crowd of disciples began joyfully to praise God in loud voices for all the miracles they had seen: 38 "Blessed is the king who comes in the name of the Lord!" "Peace in heaven and glory in the highest!" 39 Some of the Pharisees in the crowd said to Jesus, "Teacher, rebuke your disciples!" 40 "I tell you," he replied, "if they keep quiet, the stones will cry out." In Jesus time peaceful kings would ride on a donkey. 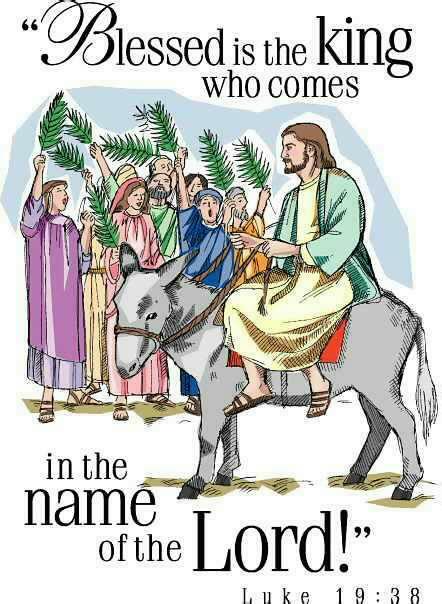 The Bible also says that the person sent by God to save his people would be seen on a donkey. On that day Jesus used these signs to show people who he was. Anyone know the name of that day? Palm Sunday, ( Sunday 4th April 2004 ). During the next week Jesus would be wrongly accused by the religious leaders. They would have him crucified, something we remember on what day? Good Friday. But, that was not the end of the story. If it was no-one would remember Jesus. On the first Easter Sunday God raised him from death. Because he is alive Christians believe can know him as their friend and look forward to receiving resurrection bodies like his that will last forever. Today we are giving our Palm Crosses. They remind us that Jesus is the King who went to the cross and rose again so we can know God as our loving , heavenly Father.